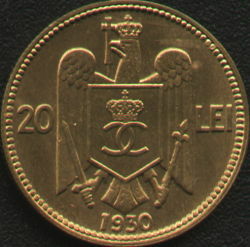 denomination "20 lei", year 1930 and wing spread, crowned eagle holding cross in its beak, sword and scepter in its talons; on eagle's breast a shield displaying the crowned monogram of Carol II instead of Romania's coat of arms, outer pearl circle the inscription "CAROL II REGELE ROMANILOR" meaning "KING OF THE ROMANIANS" and CAROL II head facing left, outer pearl circle. Under the neck lies A. LAVRILLIER, the engraver's name. 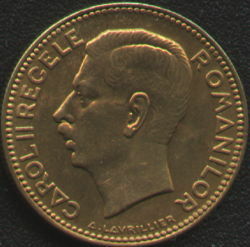 The 20 lei coins struck by king Carol II in 1930 were minted in several mints. The coins struck in Paris have a horn of plenty with coins pouring out of it (mint sign) on the left and a wing on the right as distinctive signs (the picture at right). The wing marks the chief engraver of the Parisian Mint, Lucien Bazor. At Royal Mint in London coins without any distinctive sign were struck (images above). The coins struck in Birmingham at King's Norton Metal Company are marked with K N. At Heaton Birmingham were struck coins with the mint sign H near the year (pictures below). The pictures at right and below and the information about the fact that the coins without mint sign were struck at London are present on the site through the kind contribution of Mr. Cristian Ciuplea. 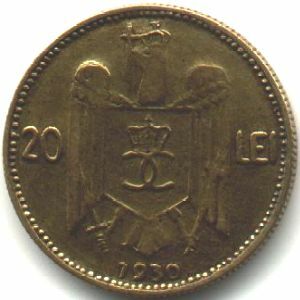 In Monede şi Bancnote Româneşti (Romanian Coins and Banknotes, 1977) it is mentioned that the coins with H and without mint sign were struck at "Heaton, London". But the coins struck at Heaton were (usually) marked by an H, and Heaton Mint functioned always at Birmingham, never at London. In conclusion, the use of the Heaton Mint name in this case is an error. The coins without mint sign were struck at Royal Mint London. It is interesting to observe that the number of teeth on the edge differs from one mint to another. There are 137 teeth at the coins struck at London and 131 at the coins struck at Paris (we checked only these two variants). 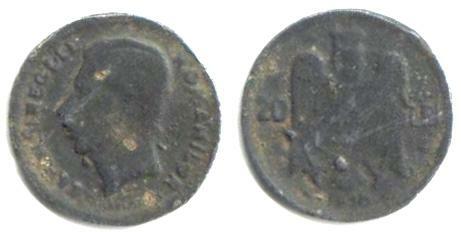 Romanian numismatics knows lots of fakes. There are the counterfeit (or bogus) pieces, as would be the "mărţişor" coins of 1 ban 1883 and 1 ban 1888, replicas pretending genuineness and quite common on the market. Usually these counterfeits are made of a different alloy and their diameter is also different. The images above picture an easily recognizable fake by the aspect of the effigy and the shivering shape of the letters. Moreover, the mass is not proper. The piece displayed is just 7.1 grams instead of the 7.5 grams of the original. Below are the pictures of other fakes, the first having 6.6 grams and the second 10.37 grams. 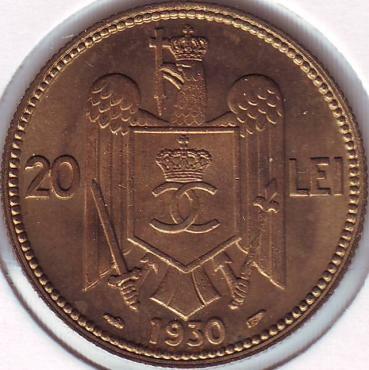 The pictures of the fake coins above were provided for Romanian coins by Mr. Moise Alexandru-Răzvan. Below are the images of a fake 20 lei made from lead. 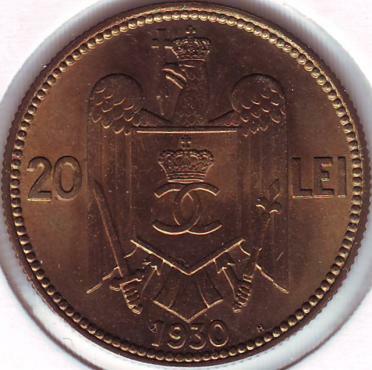 The pictures are present on Romanian coins through the kind permission of Mr. Adrian Popovici.